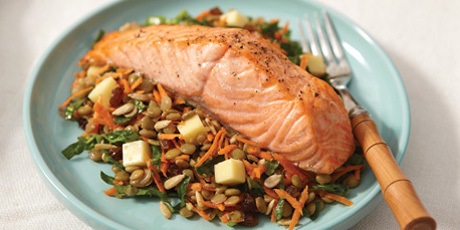 If you are in a hurry, you can use canned green lentils and salmon. 1 cup (250 ml) of dried green lentils yields approximately 3 cups (750 ml) when cooked. Smoked salmon is a delicious alternative to cooked salmon. 1. Cook lentils in a saucepan filled with salted boiling water for about 20 minutes or until tender. 2. Meanwhile, cook salmon in oven at 375oF (190oC) for 12–15 minutes. 3. In a large bowl, mix remaining ingredients. 4. Rinse lentils under cold water to stop cooking, drain, and add to bowl. 5. Toss to thoroughly coat lentils with dressing. 6. Divide salad and serve topped with salmon.